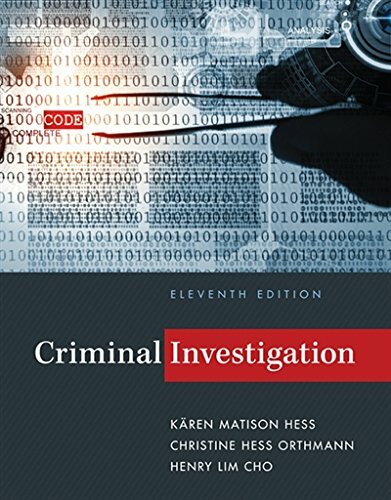 1285862619 -Easy to read and well-organized, CRIMINAL INVESTIGATION, 11th Edition delivers a practical, field-based approach to the modern investigative principles and practices you need to succeed in criminal justice. Demonstrating techniques and their many applications, the book introduces long-standing tools, practices, and policies alongside the latest innovations in technology and science to give you a broad perspective of criminal investigations today. Topics covered include D.N.A. science, terrorism and homeland security, cybercrime, crimes against children, forensics and physical evidence, investigative photography and sketching, identity theft, white-collar crime, ethics, and many others. Examples and case citations show how investigations affect the world around you. The MindTap that accompanies this text guides you through your course and includes video cases, career scenarios, visual summaries, and interactive labs that allow you to explore investigative techniques.